Mountain Man: No Instruments Required If you were to do a Google search for the band Mountain Man, you'd probably find yourself wading through search returns before finding the Vermont trio. But it's hard to miss the group's unexpected, almost supernaturally tight harmonies in this session from WFUV. The mostly a cappella trio recently performed a studio session at WFUV. If you were to do a Google search for the band Mountain Man, you'd probably find yourself wading through search returns before finding the Vermont trio. It's an unexpected group in several ways: The name, the old-time harmonies and the band's influences, which extend from church choirs to Celine Dion. 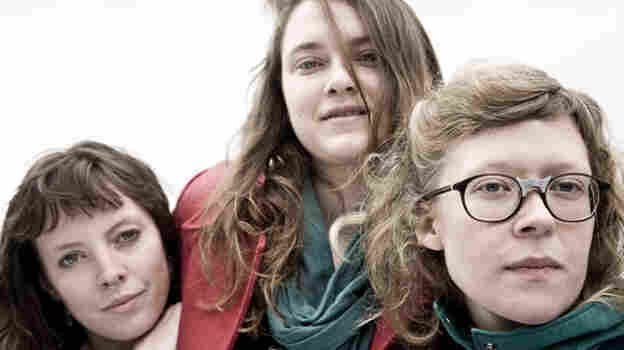 Mountain Man is a trio of women — Molly, Alex and Amelia — who started out singing in their dorm rooms at Bennington College in Vermont. Flash forward a few years, and the friends have a debut album, Made the Harbor, with a whole lot of buzz surrounding it. When Mountain Man came to WFUV, it had just finished touring with Jonsi and was about to head out on the road with The Decemberists. As you'll hear in our stripped-down studio session, the members of Mountain Man share that rare, innate gift of almost supernatural harmonizing. What seems to be simple on the surface is actually quite complex, as the group's homemade, homespun music creates an ethereal experience.